Fantastic Beasts: The Crimes of Grindelwald is about to hit theaters. This time around, the magical franchise will be telling more of Dumbledore and Grindelwald’s story, touching on the fact that J.K. Rowling wrote Dumbledore as a gay character. Elsewhere, there’s been some commentary about keeping Johnny Depp in the franchise thanks to his personal life problems, leading to plenty of people talking about the movie online. The comments haven’t always been great, and Ezra Miller, who will be back playing Credence in the new movie, clearly thinks people should just go see the darn movie before they start judging the final product. In terms of Albus Dumbledore’s sexuality, previously it seemed as if Fantastic Beasts: The Crimes of Grindelwald would not focus on Dumbeldore’s sexual relationships. Then, just a few weeks ago, director David Yates said that the narrative “doesn’t focus on his sexuality” but that part of the storyline will be present and is important to the character’s life. In the final trailer for the movie, we also saw Jude Law’s Albus Dumbledore unsheathe the Mirror of Erised and see Grindelwald staring back at him. That moment both calls back to the desires Harry Potter saw in the mirror in the previous franchise movies and the conversation he had with Dumbledore following the use of the mirror. You can catch the moment, below. 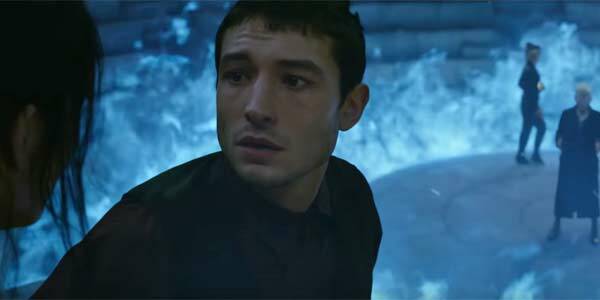 Ezra Miller also spoke with Total Film about how moments like those are presenting “Dumbledore’s queerness” to a big screen audience. Five movies are eventually expected to be produced in the world of Fantastic Beasts. Even if Fantastic Beasts: The Crimes of Grindelwald isn’t overall a love story, there may still be room to tell more of Dumbledore’s story from a romantic standpoint later on. If and when that happens, it’s likely Ezra Miller will have the same advice: Just watch the movie before you decide whether or not it’s worth complaining about.